BARBOURS CUT, THE FIRST CONTAINER TERMINAL TO SERVE THE US GULF: The terminal celebrates its 40th year of operations this year. New Houston cranes will reach their destination after a two and a half month journey. New Houston cranes are slated to replace three older ones at Barbours Cut terminal. New Houston cranes are part of a $700 million modernization program to increase efficiency and capacity. Three new super postpanamax cranes bound for Port Houston’s Barbours Cut Container Terminal departed Shanghai, China Sunday, aboard the ZHEN HUA 13. Along the journey these 405 feet tall cranes will travel with booms fully raised. Once they reach their destination after a two and a half month journey, the cranes are slated to replace three older ones at the terminal. The cranes are part of a $700 million modernization program under way at Barbours Cut to increase cargo-handling efficiency and capacity. 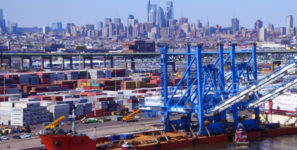 In addition to new cranes, other improvements—including wharf and container yard reconfiguration measures—are expected to increase terminal capacity from 1.2 million to two million TEU, adding to the 14 ship-to-shore wharf cranes and 44 rubber-tired gantry cranes (RTGs) currently operating there. Commenting on increased investments along the Houston Ship Channel, Port Houston Executive Director Roger Guenther remarked that “considerable improvements are being made by Port Houston as we strategically prepare for expected growth.” It is anticipated that the US gulf region will see steady growth in coming years due to increased production and export of plastic resins, which should follow several plant expansions along the Houston Ship Channel coming on line. Barbours Cut, the first container terminal to serve the gulf, celebrates its 40th year of operations this year. Port Houston also owns and operates the Bayport Container Terminal. Both facilities can serve 45-foot draft vessels, and together are responsible for nearly 70 percent of all of the container cargo business along the gulf coast, and 95 percent of the container activity in Texas. In another milestone, last month Port Houston announced that Barbours Cut established a new record for container lifts from one vessel: 4,198 moves were completed while working the 5,000 TEU COSCO BOSTON. The $33 million purchase of Port Houston’s newest super postpanamax cranes was approved by the port commission in 2015, and they are expected to be delivered to Barbours Cut around October 7.